"Museum Textile Services provides high quality work with a great deal of personal care. Your treasured item will be treated with the respect it deserves." At Museum Textile Services we specialize in helping small museums and historical societies take control of their textile collections. Our customized collections survey is tailored to the needs of your institution, whether you require a general overview of the museum or a detailed examination of a particular aspect of your collection. Collections surveys are equally important for new and tiny museums as they are for larger institutions seeking grants and project support on a national level. "I always feel as if you care as much about our textiles as we do and soon know more about them them in some ways than we do. You have a very personal and tender relationship with everything you care for and things come back looking and feeling blissfully relaxed and happy." Conservation is an essential component of every successful exhibition. Items being considered for display must be examined in order to determine whether they are stable enough. 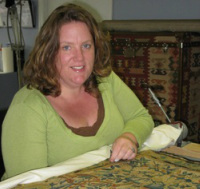 If necessary, conservators will clean the items and make essential repairs. Often a display mount, lining, or hanging system must be constructed and installed. During and after the exhibition, items must be reexamined for any new damage or soiling. Museum Textile Services is pleased to step in at any point in an exhibition, but we encourage you to contact us in the early planning stages.